Missouri Mission of Mercy 2013 - Cape Girardeau, MO Dentist - Janet B. Ruopp D.D.S., Patrick R. Ruopp D.D.S., & Nathan Seyer D.D.S. 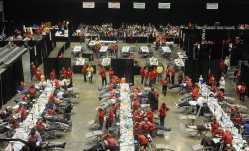 Hundreds of Dental Professionals provide FREE care to Thousands! Saturday, May 4, 2013 concluded the second ever Missouri Mission of Mercy (MoMOM). Preliminary estimates indicate approximately 1,775 adults & children received free dental care! The two day event brought volunteers from more than 8 hours away and patients drove hours and even camped out to be part of this event. Final numbers are still being tallied, but well over 2000 extractions, 1500 fillings, and 600 professional dental cleanings were provided to anyone who braved the weather and had the patience to wait for treatment. Total that is nearly $1,000,000 in FREE dental care provided to patients right here in Southeast Missouri! A special thank you to all the dental professionals & lay volunteers who donated their time & all the patients who waited for several hours with us while still maintaining patience! We appreciate you all!